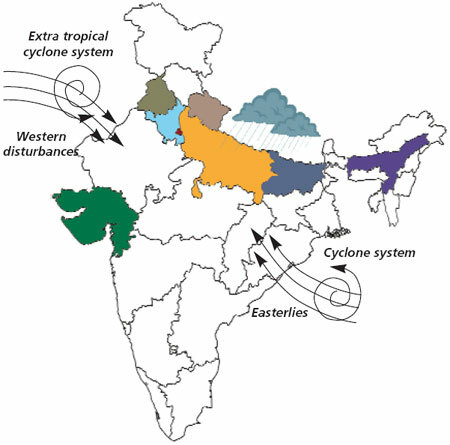 Weather scientists attributed the recent heavy rainfall in northern India to the interaction of western disturbances with the monsoon systems from the Bay of Bengal. The moisture carrying western disturbances normally cause rains in northern India. This year these winds penetrated deeper into the plains. The frequent western disturbances blocked moist winds (easterlies) from the Bay of Bengal and caused clouds to move upwards, leading to above normal rainfall in localised areas. The excessive rainfall was partially due to the La Nina weather condition—extensive cooling of the central and eastern Pacific ocean.